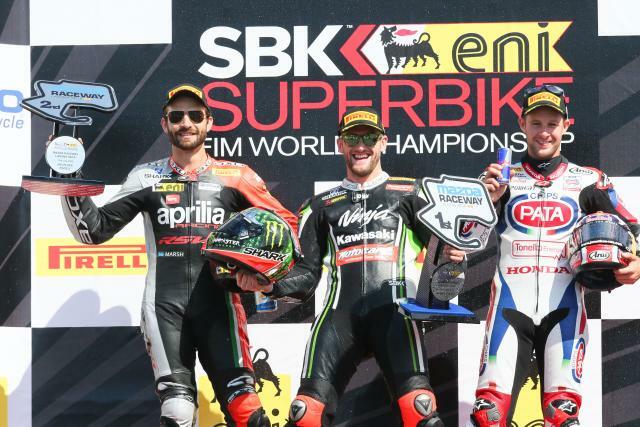 REIGNING World Superbike Champion Tom Sykes has extended his lead in the standings to 44-points ahead of Aprilia's Sylvain Guintoli. Jonathan Rea has moved up to third demoting Kawasaki's Loris Baz to fourth with 20-points between them. Marco Melandri lies in fifth 36-points behind the Kawasaki rider. After crashing out of race one and being unable to start race two at Laguna Seca, Ducati's Chaz Davies is in sixth with no change to his points except for Davide Giugliano closing the gap to only 6-points. Voltcom Crescent Suzuki's Eugene Laverty is in a respectable ninth place whilst his team-mate Alex Lowes is 11th after a DNF in race two due to crashing out.